Light Olive, Dark Green, Brown, Ochre or tan military jacket with no visible buttons or zippers shown. Most jackets seen on screen have stand up collars. Russian Afghanistan campaign jackets (tan) are seen on some troopers, while Czech. and German field jackets appear on other troopers in shades of greens and browns. Some jackets have a red to red-orange or black Rebel Alliance “Starbird” logo spray-painted or stenciled on them. Starbird logo must match screen used location and size if applied. Long-sleeve mock turtleneck shirt – cream, light tan or ivory in color. Dark green or brown in color. Military trousers with no leg-side pockets preferred. brown leather or leather-like material with metal rectangle buckle. Belt should be 1.75” to 2” wide and Range Tan or Canyon Tan in color. Black or brown, flat, wedge-soled boots with two dual-strap Velcro closures. Fugu Japanese Super Boots as seen on some on screen troopers and in the Visual Dictionary. Po-Zu Well-2 brown or black boots or similar to match screen references. Black low-cut boots or black shoes with rounded toe with dark brown or dark green colored gaiters to match screen references. 1. 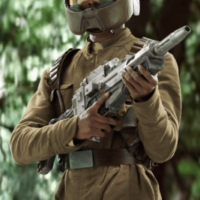 Screen-accurate flip-front combat helmet. 2. Canvas patrol cap or other similar cap. A Russian Afghanistan campaign cap with back flap is seen on a few troopers; “desert” style caps and standard patrol caps are acceptable as long as they match screen references. 3. Leather or leather-like material belt boxes to match screen references. 4. Blaster– BlasTech EL-16 or EL-16HFE blaster rifle or refurbished DH-17 blaster where allowed by law. 1. Sidearm and holster- Glie-44 Erliss Ryloth Defense Tech Pistol – accurately modeled and appropriately painted. Holster should be Black/Charcoal/Dark Grey or brown molded holster of a hard/stiff material and secured with rivets/Chicago screws and affixed to the belt via a loop of grey webbing/strapping. 2. Backpack– Canvas olive drab or tan pack with two strap closures . The pack must match Match screen references concerning greeblies, adornments and number of pouches and straps. 3. Ammunitions bandolier– Brown or green to match screen references. 4. Gloves– black or brown leather or leather-like material short gloves matching those seen on screen. 5. Goggles– White or black frame with white or grey strap consistent with shapes and colors as seen on screen.